Abu Dhabi, UAE: Zayed University booth witnessed hundreds of young students, who familiarized themselves with current bachelor’s and master’s degree programs, which are on offer at the university during the first two days of Najah Education and Training Exhibition and Career Fair in the capital. The three-day fair, which was held at the Abu Dhabi National Exhibition Center (Adnec), started on October 25th and will end today (Thursday). Zayed University booth also attracted many fresh graduates and job seekers, who came to decide their career path to pursue with valuable advices from acknowledgeable staff and faculty members. 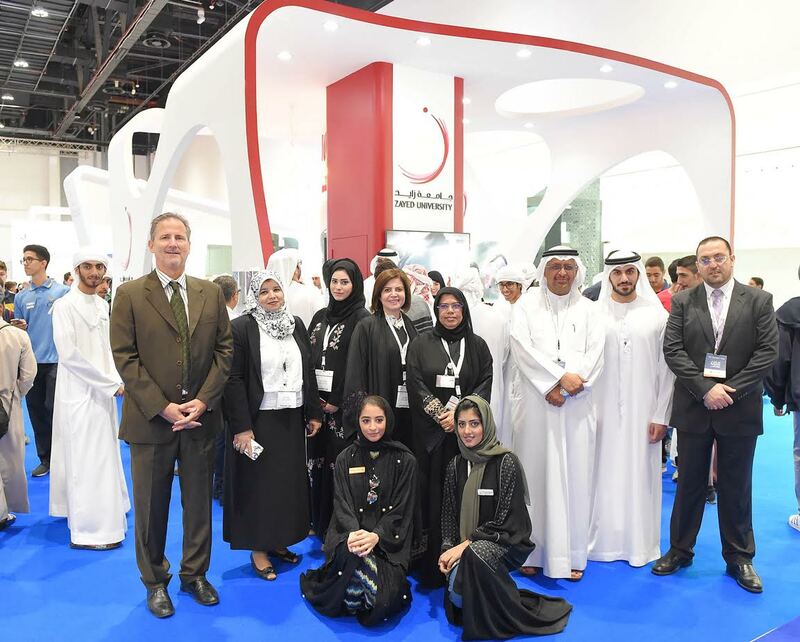 Professor Reyadh AlMehaide, Vice President of Zayed University, inaugurated the first day of Najah Exhibition at Adnec in the presence of Dr Fatima AlDarmaki, Assistant Provost for Student Affairs and other administrative staff, faculty members, and members of Zayed University Student Council. During the fair, AlMehaideb announced the launch of a pilot project, which considers the first of its kind in the region and is designed to build a positive university climate through youth leadership, engagement, mentoring, peer helping, and service learning. “The new program, which will be implemented at the beginning of next year, is part of the Peer Assistance Leaders (PALs) Support Center’s activities, which are focused on peer interaction, peers support and role modeling to strengthen the impact of academic success, especially when students work together. The program will allow students to earn an electronic badge (ZU PAL, PAL Mentor, PAL Manager) based on number of hours spent weekly to support other students, who might be daunted by some obstacles they face, in addition to a certified academic and extracurricular activities record as an evidence based practice following graduation,” Professor AlMehaideb added. PALs are students who generally have a good academic standing and are willing to support other students who need help. They must complete at least two semesters at Zayed University and maintain a cumulative GPA of 3.0 or greater.